THE first day of the 2014 Electronex Expo is coming to a close and after talking to the Hetech team on the show floor, it’s been a busy day. Trade visitors and conference delegates from around Australia, NZ and overseas attended the expo today, with many of them enquiring about Hetech’s products and services. Electronex also co-hosts the SMCBA Electronics Design & Manufacture Conference staged by The Surface Mount & Circuit Board Association. Hetech’s very own General Manager, Mark Steiner, is holding an information session at the conference this afternoon, discussing the pros and cons of purchasing and manufacturing offshore. Definitely worth a listen if you’re there. Hetech is proud to be a sponsor of Electronex 2014 and we’re serious about helping you with your electronics design and manufacturing needs. So come down and get some expert advice from Mark and Jeremy from the Hetech team, stand #C25. Doors open tomorrow from 10am – 5pm. 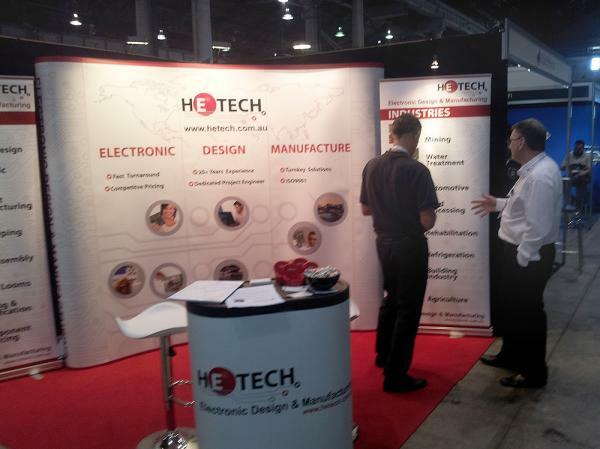 Pictured: General Manager Mark Steiner with a customer on the Hetech stand.